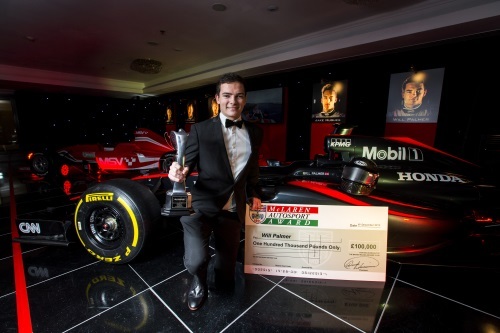 Will Palmer, the 2015 BRDC Formula 4 champion, was announced as the winner of the prestigious McLaren Autosport BRDC Award (MABA) at the end-of-season Autosport Awards ceremony held at Grosvenor House in London last night (Sunday 6 December). The 18-year-old was selected as the victor by a panel of judges consisting of motorsport industry experts and claims a coveted prize package which includes a cash sum of £100,000 and an invitation to test a McLaren Grand Prix car. The MABA was established in 1989 to help progress the careers of outstanding young British racing drivers, with previous winners including David Coulthard, Jenson Button, Anthony Davidson and Dario Franchitti. Palmer becomes the second BRDC Formula 4 Champion to claim the award, following on from 2014 Champion George Russell’s success in last year’s MABA. Since its inception in 2013, the BRDC Formula 4 Championship has had a strong presence in the award, with nine of the 14 drivers to have been nominated in the past three years having competed in the series; inaugural champion Jake Hughes and 2015 Autumn Trophy victor Ben Barnicoat were also nominated for this year’s MABA. The other finalists for the life-changing award included Formula Renault 2.0 Eurocup and NEC Champion Jack Aitken, in addition to MSA Formula drivers Ricky Collard and Toby Sowery. The six nominees underwent fitness and simulator assessments before facing a rigorous two-day test on the Grand Prix track at Silverstone in Formula 2 single-seater, DTM Mercedes and McLaren 650S GT3 machinery. The sextet then faced interviews with a panel of experts before the judges consisting of BRDC President Derek Warwick, two-time British Touring Car Champion Jason Plato, McLaren's Andrew Kirkaldy and Mark Williams, leading circuit commentator Ian Titchmarsh, Autosport features Editor Scott Mitchell and Motorsport News Editor Kevin Turner selected Palmer as the winner. Palmer, who hails from Southwater in Sussex, enjoyed a stunning 2015 campaign in BRDC Formula 4, winning exactly half the races across the season with 12 victories, in addition to three other podium finishes. He wrapped up the title with three races still left in the season and amassed a record points total, finishing 137 points clear of his closest rival and HHC Motorsport team-mate, Harri Newey. Palmer said: “It's absolutely unbelievable. Every year I see the six finalists on stage and dreamt of one day taking part, it's an amazing opportunity. "Now that I'm here as the winner, it's absolutely unbelievable. The first day was my first experience of all the cars, which are a lot quicker than my BRDC Formula 4 car, so I went away after that, thought about where I could improve and managed to pull out some laps that I was very happy with. BRDC President Derek Warwick added: “On the first day, there were two drivers that were exceptional in the McLaren and the DTM cars and then on the second day, this guy (Palmer) came alive, it was unbelievable. On two sessions on used tyres he was really quick then we put some new tyres on and he was sensational, he took our breath away to be honest.